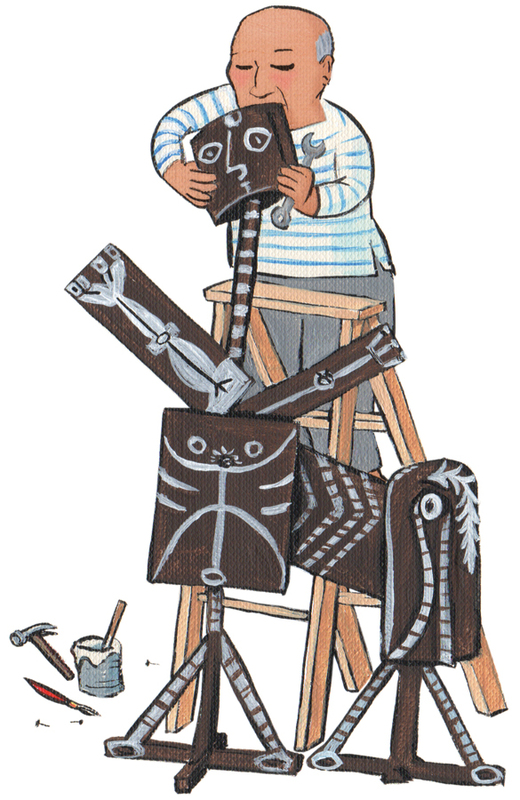 Over the summer I worked very hard illustrating a new book duopress book, written by Mauricio Velázquez de León: 100 Pablo Picassos. 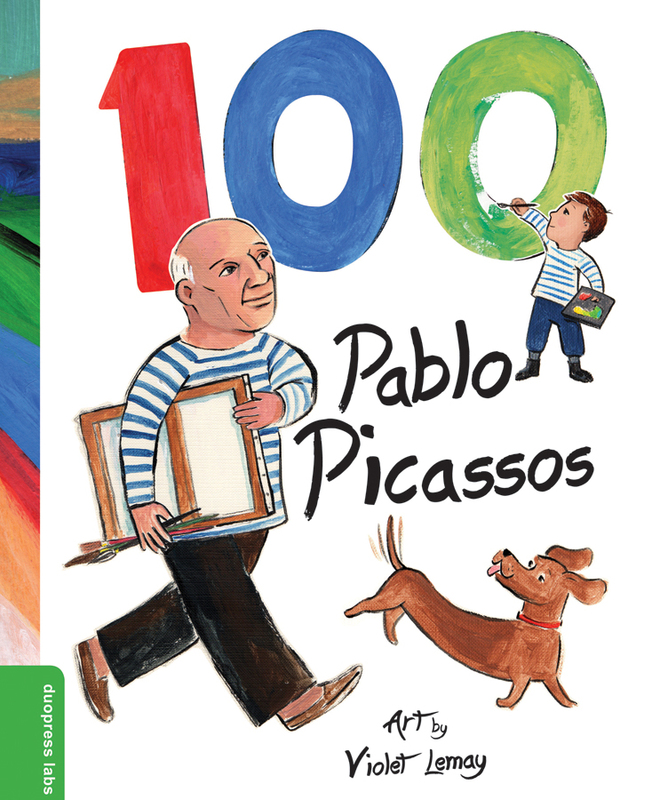 100 Pablo Picassos is a 32-page children’s picture book, every square inch of which is crammed with full-bleeding spreads as well as tons of spot illustrations. I got to draw Picasso doing everything from painting and sculpting masterworks to doodling on a sketch pad in the bath. After the release date, I’ll write a nice long post about how we made the book, which is the brainchild of the author Mauricio Velázquez de León. It is February as I’m writing this post, three months before the official release date of 100 Pablo Picassos; however, hard copies are already available for pre-order and will actually materialize everywhere books are sold in April, and the e-Book versions are good to go now. As a contributor, it’s time for me to start making some noise! Thanks to my former life as a professor of self promotion, there is a small part of my brain that is always clicking away, trying to come up with innovative ways to publicize whatever project has been holding my attention. The obvious first step is always social media, because it is easy and free. Perhaps most obvious way for an illustrator to promote her upcoming book is to generate interest by sharing the art that she’s already created for the project on Facebook, Twitter, Instagram and etc. 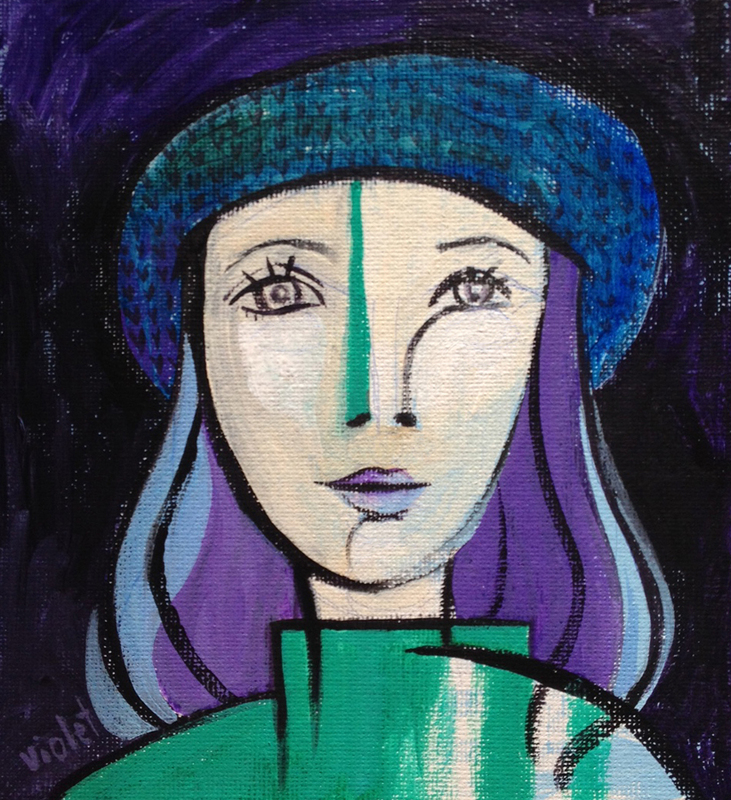 I’ve been taking advantage of the plethora of illustrations that we created for 100 Pablo Picassos, posting little bits of it daily—along with interesting photos and facts of Picasso’s history acquired from the internet—on my Violet Lemay Illustration Facebook fan page. I’ve been pacing myself, “leaking” the art slowly, a task made easier for 100 Pablo Picassos because it contains many, many spot illustrations; however, the same approach can be applied to a book whose every page is covered with full-bleeding two-page spreads. 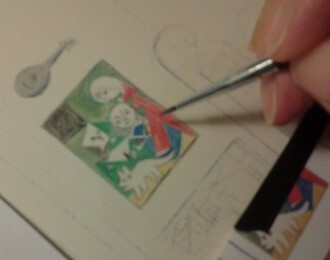 The artist of such a book could tease her audience and draw out the promotion process by posting close-up detail shots from each spread, leading up to the big moment when she posts the whole image in its entirety. One advantage that book illustrators have over authors in the area of promotion is that, for any given project, we can create as many additional visuals as time and interest allow. As you can imagine, immersing oneself in the history of Pablo Picasso, one of the world’s most colorful and prolific artists, was both humbling and inspirational. Picasso’s life and his work drew me in as an artist, inspiring a bevy of personal work aimed at promoting the book. First, I dabbled in acrylics creating Picasso-esque portraits of friends and family members for some upcoming gallery exhibitions. This was so much fun, and was one of those roads down which I had to walk—it was either that, or die. You artists know what I mean. Some inspirations tickle a little and make you twitch; others come at you with a whip. I will write about those portraits and the gallery shows in greater detail later this spring as the dates get closer. Or perhaps after, so I’ll have photos to share. Let’s wait and see. More recently, spurred on by the approach of Valentine’s Day, I’ve been working on a series of small, quickly-done watercolor portraits of Picasso’s many love interests. 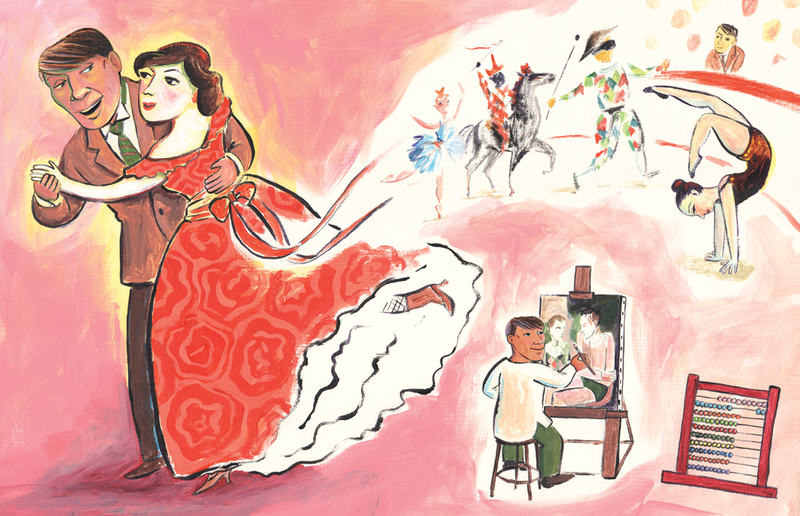 Even a tiny bit of digging into Picasso’s romantic life produces results that can only be described as spectacular. Because 100 Pablo Picassos is a book for children, the author handled the entire topic with grace, tact, and an absolute minimum of words. We show only one of Picasso’s many lady friends in 100 Pablo Picassos, so I had only one existing painting on the topic to share for Valentine’s Day (above), which features Picasso’s first girlfriend/muse, Fernande Olivier. Knowing the truth about Picasso’s romantic life as I do now—so many women, all who had an impact on his art in a profound way—the idea of posting only a single image on the topic seemed underwhelming. I could have devoted my daily facebook posts to photos of all of his varied wives and paramours, but I am an illustrator after all. Instead, I decided to paint them—quickly this time, and much smaller that my previous Picasso-inspired portraits. 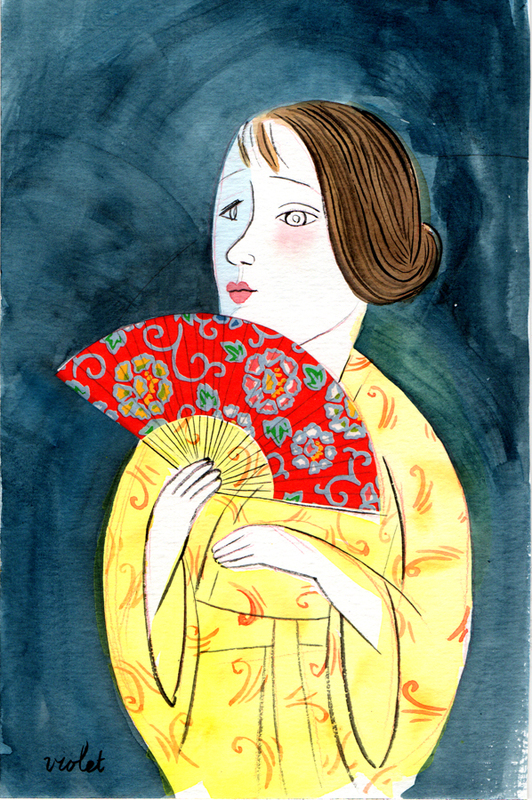 The result is a new and ever-growing series, including this watercolor portrait of Eva Gouel. I will be posting my portraits along with interesting photos and facts about these lovely ladies (including Bridgitte Bardot, the object of a Picasso crush!) on my Violet Lemay Illustration Facebook fan page, as well as on Twitter, Tumblr, and Pinterest—all for the cause of promoting the upcoming release of 100 Pablo Picassos. I would love it if you’d follow along. If all of this has piqued your curiosity about the women in Picasso’s life, you may enjoy reading Madame Picasso by Anne Girard (Harlequin MIRA, 2014). Madame Picasso, a novel (historic fiction), tells the story of Eva Gouel; it’s a fascinating read that slows down a few years in the life of this great man, whose timeline is regularly assessed in large spans. Click here for more details. To order 100 Pablo Picassos, click here. Meet 8-year-old Isabella Ivory Edelston-Finch, the star of Isabella’s Shoe Studio. Isabella’s Shoe Studio is a Doodle Storybook™ book that I wrote and illustrated with the help of my friends at duopress in 2013. To help promote the book, I’ve pursued every creative idea that’s popped into my head. Then, I designed paper dolls for promo events. The photo on the left was taken at aMuse Toys in Baltimore. 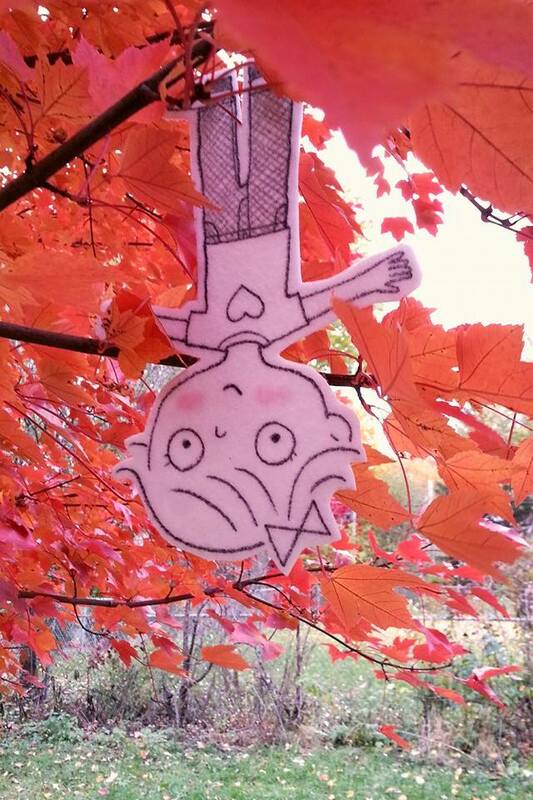 Seeing all of the cool ways that kids were adding color to the paper dolls gave me a new promo idea: Vine stop-motion animation!
. . . . . V i n e . . . . .
Vine is a mobile ap/social site owned by Twitter that features 6.5 second videos. To create vines, you have to load the Vine ap onto your phone (no video cameras!) and set up an account, which is very, very basic. Once the ap is loaded and running all you do is click the video icon to get started. Touch the screen to record. As long as you hold your finger on the screen, you are capturing video. The trick with Vine is logistics. I found it next to impossible to hold the phone, touch the screen and arrange my chosen shot, all at the same time. 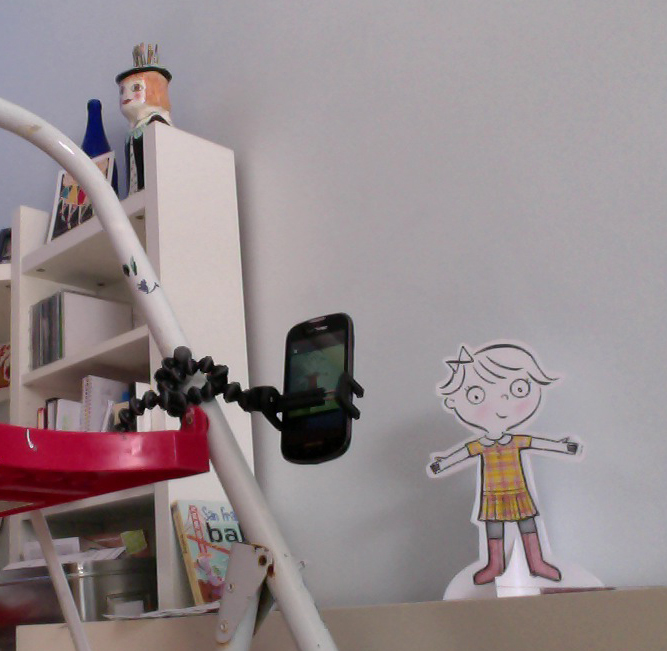 In order to make frame-by-frame animation, I needed a device to hold the phone for me. I ended up buying Joby’s gorillapod flexible tripod. After coloring a bunch of dresses, attaching the tripod to a stepladder and taping my Isabella paper doll to the shooting surface to keep her from moving, the rest was easy. I recorded her for a few clicks, changed her dress, recorded some more, and so on. Click the image to the right to watch the resulting vine. If you’re unable to view it, create a vine account following the steps above— it’s easy! While you’re working on your vine, a progress bar on your phone’s screen shows you how many seconds you’ve recorded, so it’s easy to gauge your progress. 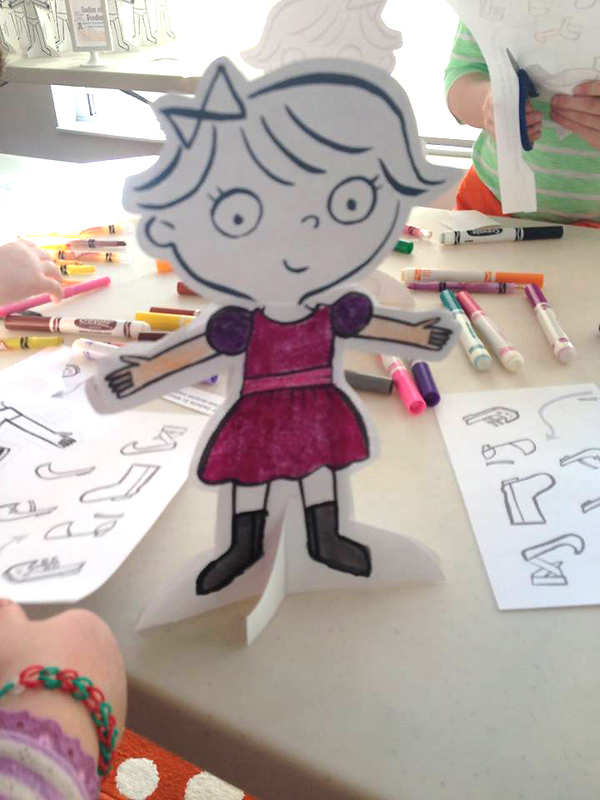 The paper doll animation is adorable but we felt it didn’t showcase the true nature of Isabella, or the intention of Isabella’s Shoe Studio—which isn’t really a “fahsion-y” kind of book. 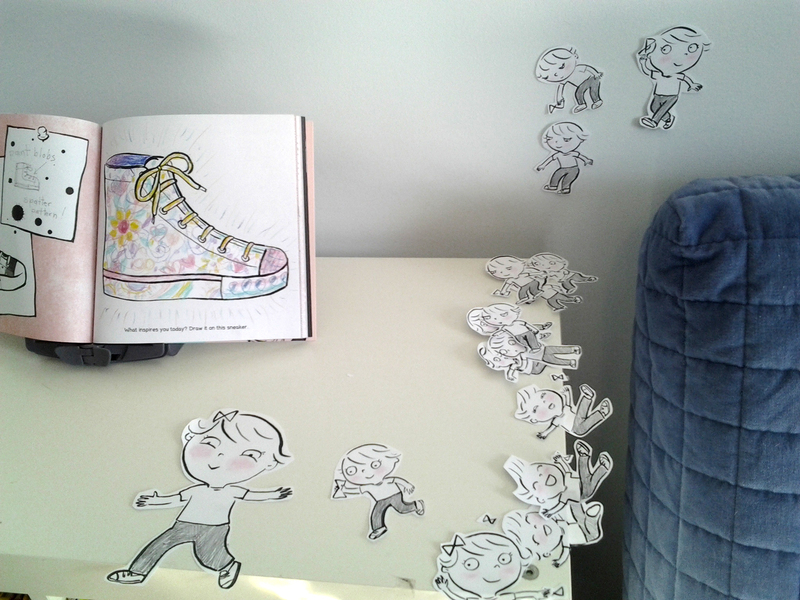 After flipping through a copy of Isabella’s Shoe Studio for inspiration, I decided to attempt a more elaborate stop-motion animation in which Isabella actually moves, and interacts with a shoe illustration in the book. The high-top sneaker on these pages spoke to me. The text on that page says, “What inspires you today? 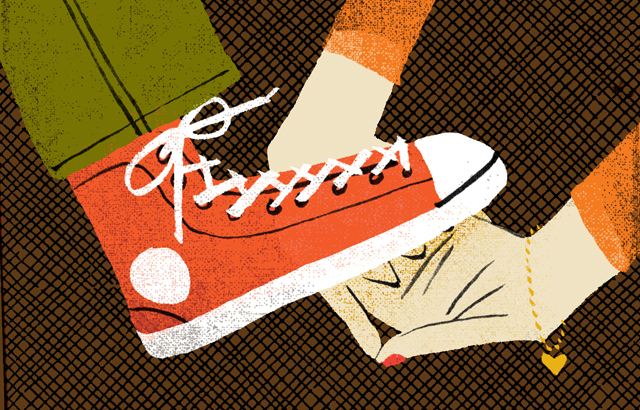 Draw it on this sneaker.” I saw Isabella popping out the top of the sneaker with a pencil. Isabella would touch the blank surface of the shoe with the pencil, and the shoe would proceed to decorate itself as she slid down the side of the high-top. That was my basic idea, which became slightly more elaborate as I got to work on making the vine. To begin figuring out how to shoot the vine, I made a frame-by-frame storyboard. The storyboard became my go-to reference throughout the entire process. After watching some incredible animated vines by Pinot and Ian Padgham (see links at the bottom of this post) and counting the clicks, I figured I’d need between 20-30 frames. Because a page from an open copy of Isabella’s Shoe Studio would be the “stage” for this animation, I made 3o grayed-out prints of the page from the book—approximately one page for every frame. 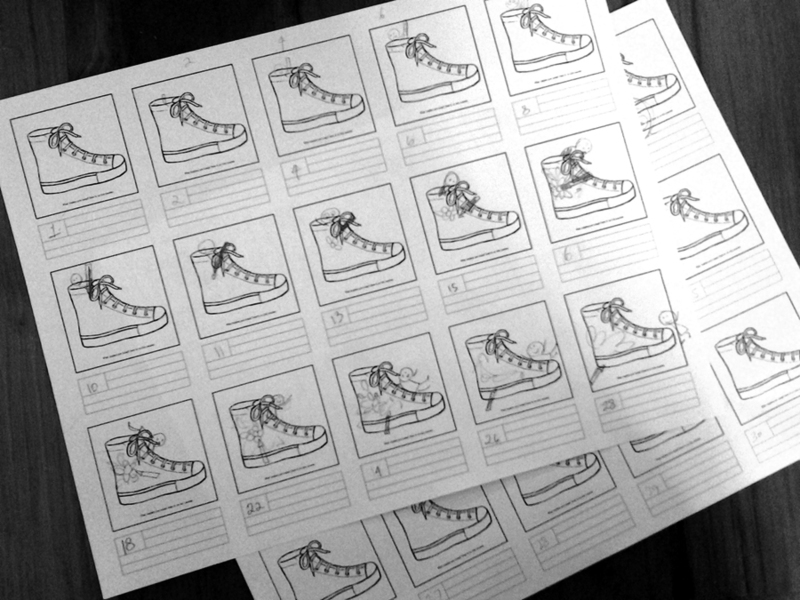 Then, using a light table, I penciled Isabella onto every sheet making her interact with the shoe—old-school animation style. In addition to animating Isabella I knew I’d have to color the shoe as I went, which meant drawing in a copy of Isabella’s Shoe Studio. I didn’t want to use more than one copy of the book for this project, so I couldn’t draw Isabella directly onto the open book. 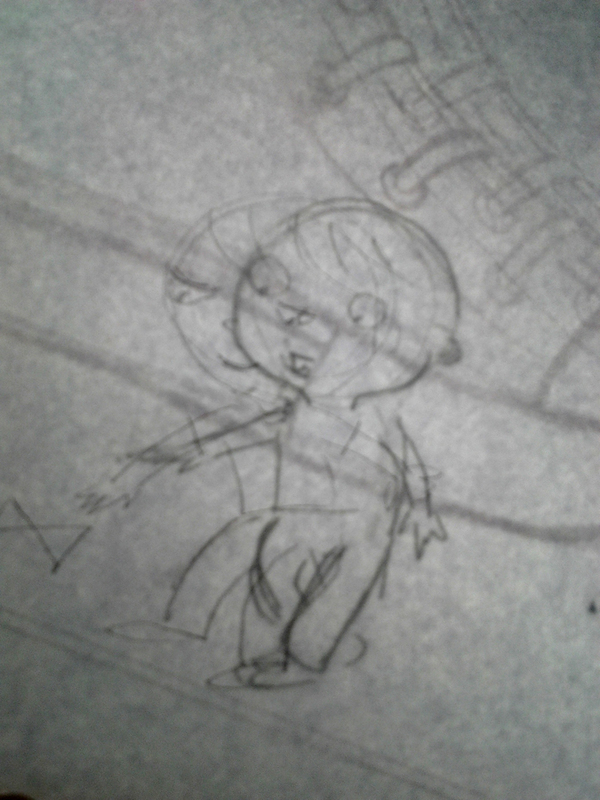 Instead, I used the light table again to ink the drawings onto clean printer paper. 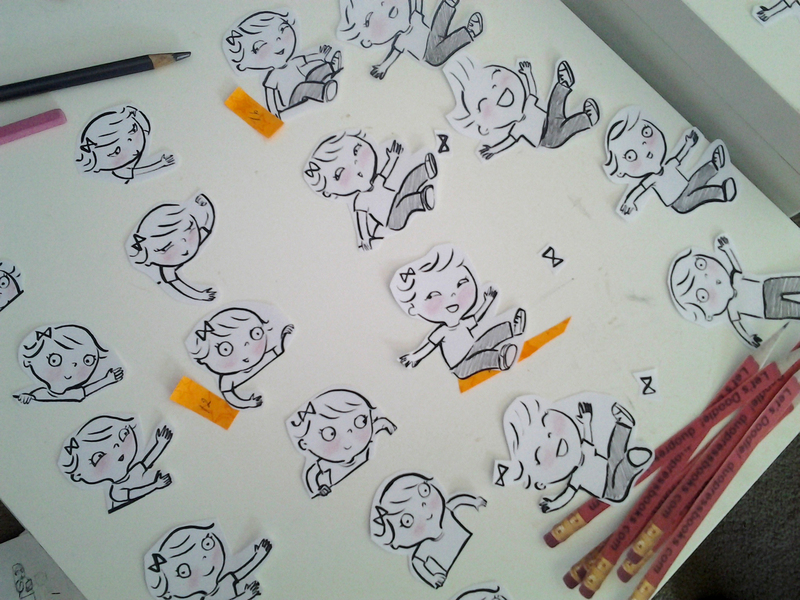 Then I cut them out and lined them up on my work surface. I quickly shaded her jeans with an Ebony pencil and used a pink crayon stick to blush her cheeks. Once all of the little Isabella’s were cut, colored and arranged, I stuck some bright orange notes among the cut-outs to keep myself on track time-wise as I shot the vine, and to keep the cut-outs organized and true to their corresponding frames on the storyboard. Besides Isabella and the shoe, the third element in the animation was the pencil. My idea had it popping out the top of a 2-D drawing of a shoe, so it had to be flat, not a real pencil. To make the pencil I photographed an actual duopress pencil, adjusted the photo in Photoshop, printed 12 copies on a single sheet of card stock, and cut them out. Voila: pencil! The last step (and quickest, by far!) was to shoot the vine. With the book propped up on my trusty Ikea bookshelf, an area that is well-lit by both the sun and overhead electric light, I used double-sided tape to attach each cut-out to the page, one at a time. Between each shot I added a bit more color and design to the shoe—because, after all, Isabella’s Shoe Studio is a book that invites you to design and decorate shoes! The photo above shows the “stage” after shooting…. with the shoe fully illustrated, and little Isabella’s everywhere. The resulting vine is adorable. To watch Isabella slide down a sneaker, click the image on the right. Once you’re on Vine, follow me, and I’ll follow you! To order Isabella’s Shoe Studio, click here. To view my second vine (Isabella and the Sneaker) on youtube, click here. I used iSkysoft to download the vine and covert it to a .avi file, which I was then able to upload at Youtube. The version of iSkysoft that I use is not free, but is very useful for downloading various forms of moving images—including Picasa slideshows. 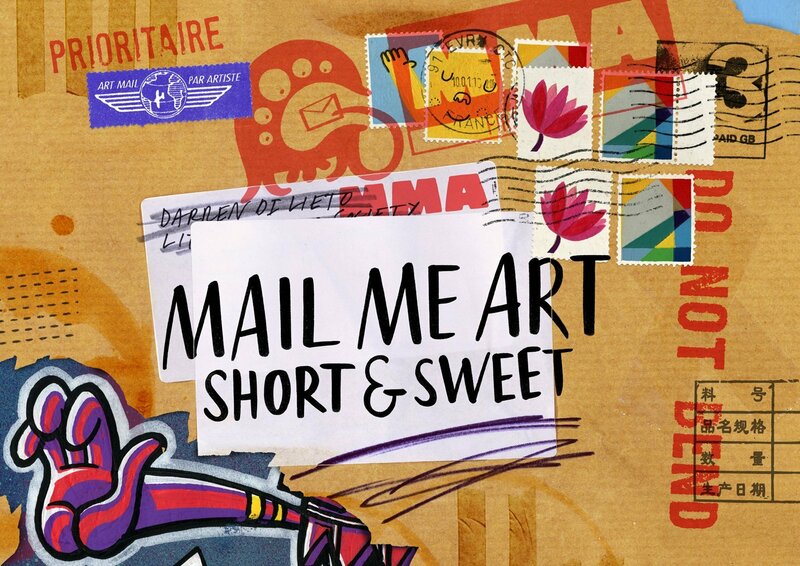 This past spring I was invited to participate in Mail Me Art: Short and Sweet, a gigantic group show that travelled to three London galleries over the summer: The Framers Gallery, Factoryroad, and Croft Wingates. The events, all for charity, were organized by my friends Darren and Jane Di Lieto. 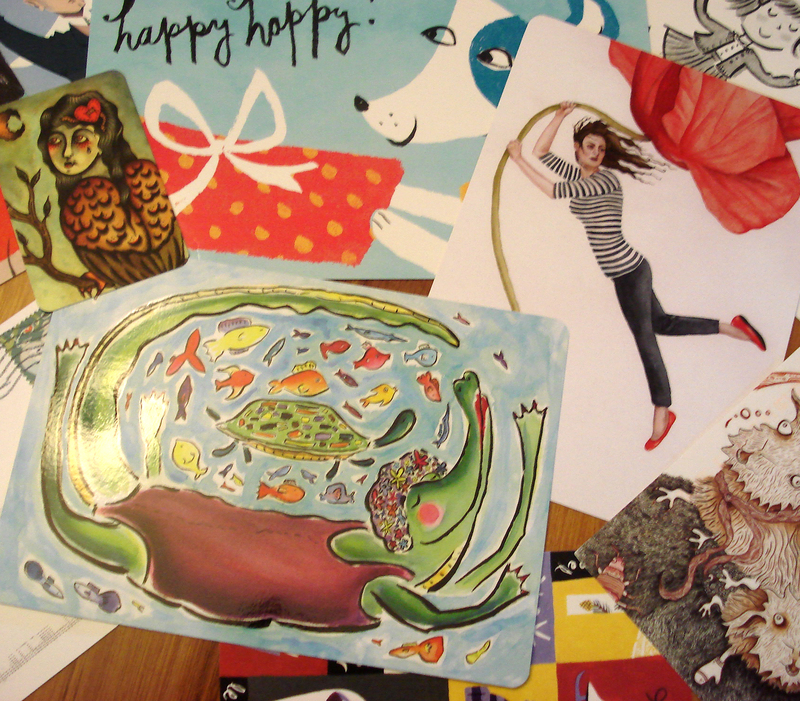 Mail Me Art is a fun little project that was created by Darren Di Lieto of The Little Chimp Society in late 2006. He was looking for a way to connect on a real world level with all of the brilliant and talented illustrators who had become part of his community and network. Mail art was the perfect way to accomplish this task. The Mail Me Art project has held exhibitions up and down the UK, and was published as a very nice book by HOW Books. It has also been featured or mentioned by Digital Arts, Computer Arts, Design Week and The Telegraph over the years. Mail Me Art is still going strong to this day and there seems to be no stopping it! When I got the call, time was in short supply. 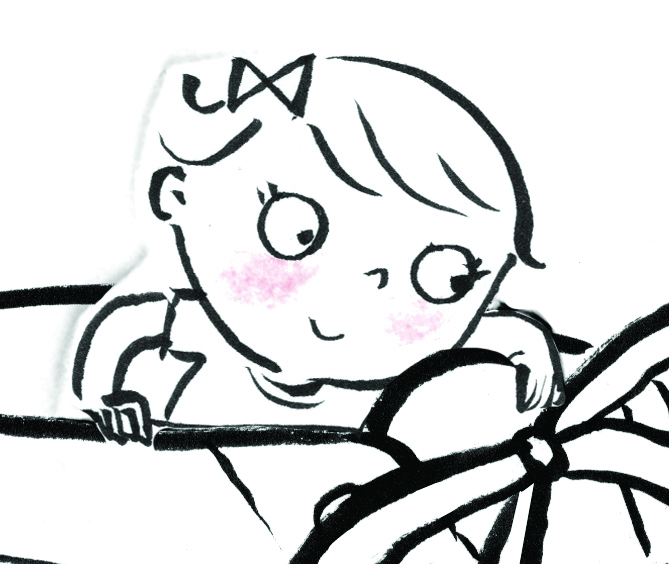 I was up to my eyeballs in work, rushing against no less than five book deadlines at once for duopress: Doodle America, Yummy Food Doodles, San Francisco Baby, Let’s Doodle Around Baltimore (a special project for the Baltimore school system), and Isabella’s Shoe Studio. I couldn’t say no. Darren has helped me out many times in the past, sharing his knowledge with illustration students in my classroom live from the UK via Skype—despite a rather hefty time difference, and his own busy schedule. We are friends. Also, I have taught self-promotion classes for many years, and I try very hard to practice what I preach. I would advise a student in a similar situation to just DO IT! Short-term pain, long-term gain. And anyway, Mail Me Art was a charity event, so I wasn’t going to turn it down. From the moment I accepted the challenge, I knew that I would paint a wing-tip shoe on a manila envelope. Thanks to overlapping deadlines, I was swimming in a sea of shoes! Happily exhausted, other ideas were not exactly floating to the surface in abundance. He asked several of us to write about the inspirations behind our envelopes, for possible inclusion in the book that would accompany the exhibit. I was more than happy to oblige. From the moment I accepted the written challenge, I knew I’d be talking about Isabella’s Shoe Studio, because that was my honest answer. 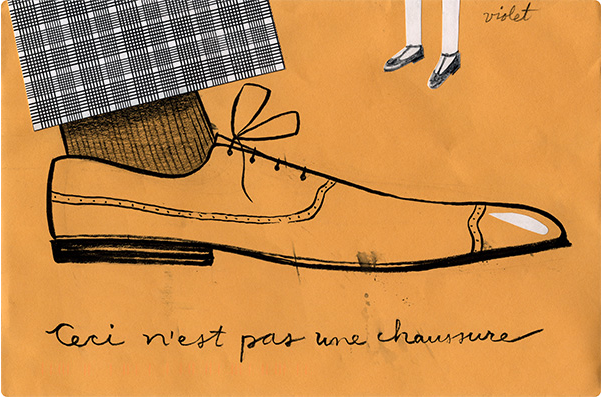 My contribution to Mail Me Art: Short and Sweet was a shoe, and the reason was Isabella’s Shoe Studio. 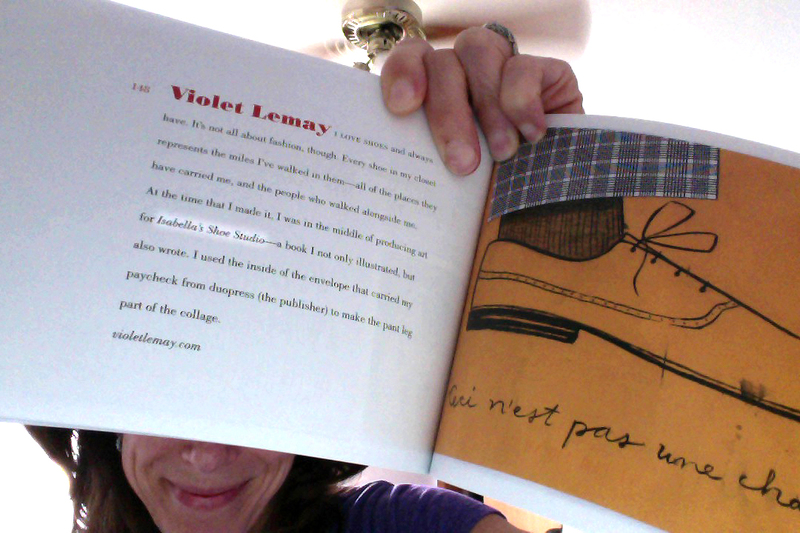 The exhibit has come and gone, but the book Mail Me Art: Short and Sweet lives on, and is available at amazon.co.uk. It is beautiful and I am honored to be included. Please click the link, have a look, and take a few minutes to write a review. Darren and I would both be grateful. Isabella is in there—she seems to be everywhere that I go, lately. 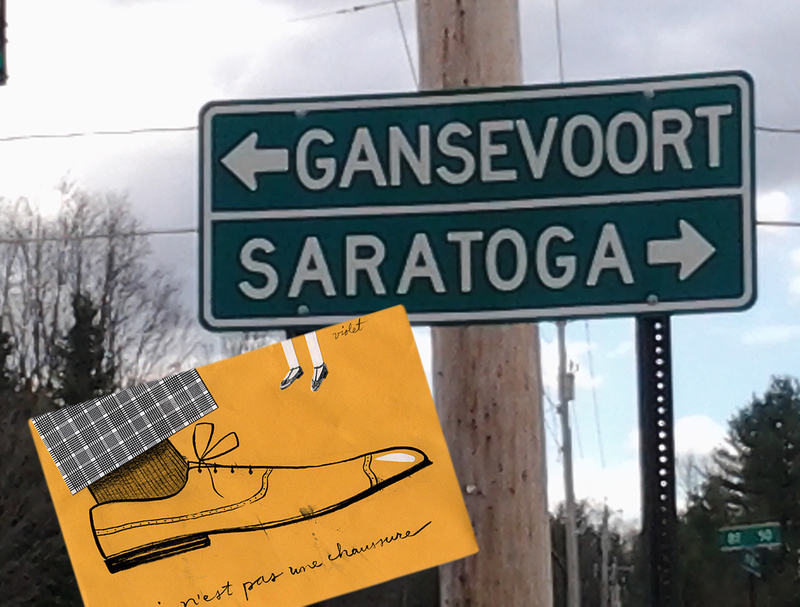 As a bonus, there are a bunch of photos in the final pages of the book (contributed by Yours Truly) of my envelope beginning it’s journey here in Saratoga Springs. The moral of the story, Class, is cross-promotion: promoting others and self simultaneously, and all (in this case, anyway) for the greater good. If you’re serious about pursuing a career in illustration, you’ve done your research. You know there are plenty of paid portfolio sites out there, and agencies, too. Portfolio sites generate income for the people who run them. They are selective but are generally happy to take on new illustrators, because in so doing they make a profit. In exchange for an upfront or pay-as-you-go fee, they will display your work among many other portfolios, all under one roof. The result: one-stop shopping for art buyers. Most illustrators participate in at least one paid portfolio site. It’s a normal part of promotion. Agencies are an entirely different matter. An agent represents the members of her group, handling contract negotiation and the bulk of promotion, for a percentage of any and all assignments that roll in as a result. Signing with an agent is the beginning of a business partnership. It’s almost like getting married. Generally, it is far easier to participate on a paid portfolio site than it is to sign with an agent. This is where Darren and Jane come in. Class, meet Darren Di Lieto, creator of The Little Chimp Society and Hire an Illustrator!. Darren (who never sleeps, apparently) is also Anna Goodson‘s webmaster, which is where I met him. While repped by AGM for ten wonderful years, I sent desperate e-mail messages to Darren asking, for the bajillionth time, How do I log in again? and Why isn’t my image loading properly? Despite this, somehow or other, Darren and I are friends—a fact of which I am very proud. Darren and wife Jane love illustration and illustrators, and have for the most part devoted their lives to furthering our cause. The Little Chimp Society is a free illustration news portal. If you are not participating, you should! Creating a new piece of art for your website constitutes as news, so don’t be intimidated. Submit your story, and watch your site stats jump as a result. 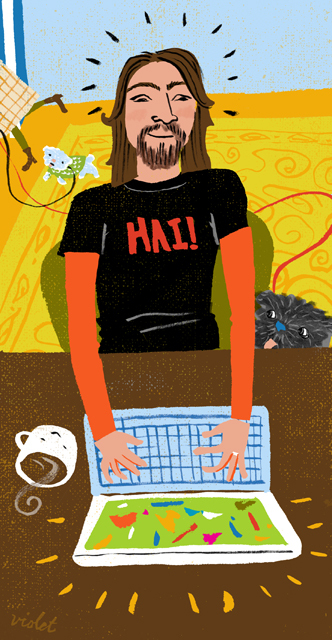 Hire an Illustrator is sort of an anomaly in the realm of illustration portfolio websites. Like so many others— The Alternative Pick, Directory of Illustration, IllustrationMundo and etc.—it is a paid portfolio site. HAI’s rates are manageable, even when you’re first starting out, which is great. But here’s the kicker: Darren and Jane offer the added benefit of sending out postcard packs to a list of clients—a perk usually provided by an agency, not a portfolio site. HAI will even handle the printing of the card for you. And, unlike an agency, HAI does not take a percentage of any work generated by direct mail. In short, Class, we owe Darren and Jane a mighty, collective THANK YOU! Check out HAI and the LCS, and tell them Violet sent ya. Dear Jane: Thanks for your every edit to the posts I submit to the LCS, and for your patience and kindness over at HAI. As I have never seen your lovely face, I thought it best not to attempt a likeness in the above illustration. But oh, I know you are there. We all do. When teaching self-promotion I cover all of the expected topics — advertising, social media, networking, etc. — most of which I will write about in subsequent posts on this blog. There is a secret spring that runs beneath the surface of Self-Promo Land, however; a spring that ties them all together, and feeds each and every promotional effort. The spring is called GENEROSITY. Yes, you should give stuff away to potential clients: pens, magnets, all of that. But generosity at its best goes deeper, affecting not only your relationships with clients, but also with your fellow illustrators. Give the gift of promo. Don’t promote yourself exclusively. Promote other people, too. Maybe they will do the same for you in return, but if they don’t, that’s okay. By definition, a true gift is freely given. Nobody likes the guy who walks around in the light of his own personal spotlight all of the time. That guy is intolerable, an annoying gnat. But, think about it: everybody likes the guy who offers light to others. Now, Class. I know some of you are thrilled to hear me say this because you are quiet little mice who prefer the cool comfort of the holes in which you live, and the thought of promoting yourself makes your blood run cold. Most illustrators I know, including Yours Truly, are introverts. To you, my fellow mice, I say this: You still have to make some noise and tell the world that you exist. Squeak! Speak up! No one knows better than you, what you do, and the services you are willing to provide to your fellow man. Don’t expect other people to do this for you. I send out postcards and advertise on various websites and use social media to promote myself directly (future posts! ), but I also use those tools — the free ones — to promote my friends. Because I want the best for them. I need to make a living, but I want them to succeed, too. We are all competitive — a good thing — but let’s face it, visual artists rival writers when it comes to being neurotic. And we all know what a mess they are (she wrote, tongue in cheek). We are convinced that everyone else’s career is going better than ours. Each of us is on a separate path, but the terrain under everyone’s feet is hilly. Every artist spends time in the valley, as well as on top of the mountain. Yes, for the past eight years or so work has been more scarce than it used to be, but that’s all the more reason to celebrate when any of us lands a new assignment. Be a generous promoter, and celebrate your friends’ successes. Your career and your life will be better for it. 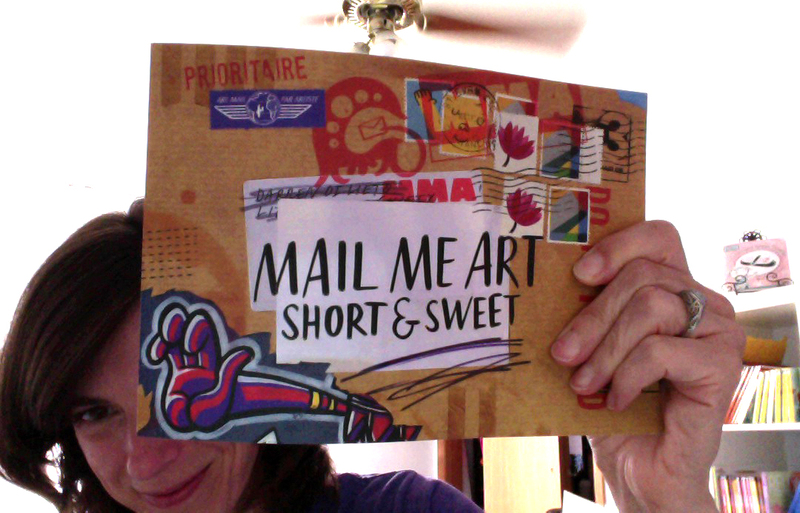 In my self-promo classes we talk a lot about where to have mailers and other promotional materials printed. I recommend Vistaprint to my students because generally they are on a tight budget, and VP prints stuff for “free” (plus upload fees, and you pay extra for UV gloss coating and shipping). 1. Look around for their special offers and promo codes. When you place your first order, join their e-mail list. You will get several offers via e-mail every week. 2. Order multiple products all at once, so you only have to pay shipping one time. 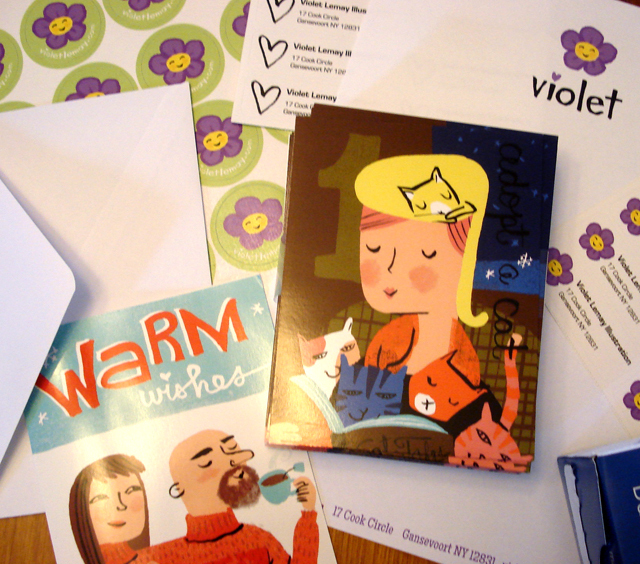 The photo above shows one of my recent Vistaprint orders: a hundred postcards, ten folded holiday cards (with envelopes), ten sheets of letterhead, a sheet of stickers, two styles of return address labels, AND two hundred and fifty business cards—all for around $60. Everything looks fantastic. I designed each piece using VP’s product templates, which are available for download (click “Artwork Specifications” under the title “Support,” at the bottom of the home page). My only complaint: I think the holiday card template is inaccurate. Beware, there. Ninety percent of my students who use Vistaprint are happy with the results. There have been a few mis-cut business cards and off-color postcards over the years, but I guess that’s to be expected every so often from any print shop. Moo is also excellent, if you don’t mind spending a little more. Unlike VP, they offer free color printing on the back. And at Moo, you can get business cards with rounded corners. Very nice. Read more about Moo mini cards on my blog. At Overnite Prints, you can get free spot gloss—awesome! And many of my students love GotPrint; this one offers special shapes, for those of you who simply can’t be put in a box. In the end, the prices and quality are all competitive. A wise illustrator will get to know all of the products offered by her favorite printer, and will use them to promote herself in various ways. And class, don’t forget: No matter the quality of the print, it’s the quality of the imagery that matters most. Moo business card by Lacey Eberle (upper left); Postcards, from bottom left to upper right: Molly Wilson and Joanna Gorham (GotPrint spot gloss); Katrina Kopeloff‘s card (VistaPrint) is cut off at the lower right.